I kept Sheik (Sloughi) on his leash since his recall is not that reliable at this point. 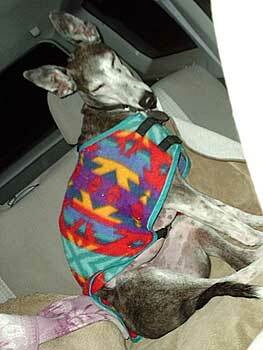 I had Barbie (Greyhound) and Kiara (Ridgeback) on a leash with a coupler. After awhile I took the leash off and left them coupled together. Ki's recall is excellent, and naughty Barbie's is not always that good. So whenever the two girls got too far out in front, I just told Ki to Wait or Come, and 55-pound Barbie had no choice but to do whatever 78-pound Kiara wanted her to do! The first time or two, Barbie dug her feet in like a little mule, but after that, she gave in and just went along with Kiara. I have a shot or two of the two of them tethered together...Barbie always in front, ready to go at the drop of a hat, and Kiara patiently standing or (when she got tired of B's dancing) sitting, waiting for Sheik and me. 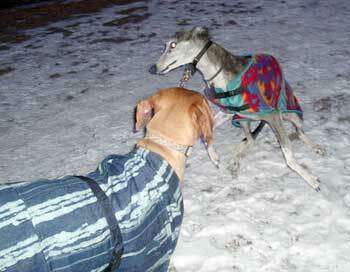 One picture shows Barbie doing her best to get Kiara to try and play. B leaped, scampered, did everything she could, and Kiara just stared at her like she was some insane wild horse that needed to be securely held. <G> (Kiara has fun, but she took that 'buddy' job of hers seriously!) 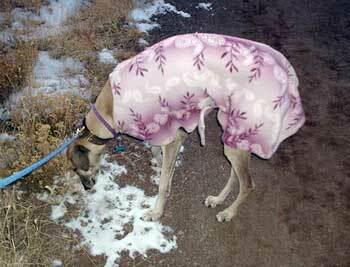 I also have one of Sheik all bundled up, sniffing the ever-aromatic coyote poop. He looooooves to take in all the scents...he is a real bundling of both sight- and scent-hound. 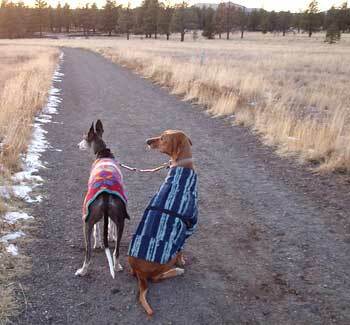 Back down at Sedona's warmer altitude (4500 ft), they all enjoyed a bully stick. Sheik likes to take his outside and eat them on the dog bed on the porch...but not in the usual way, as you can see. 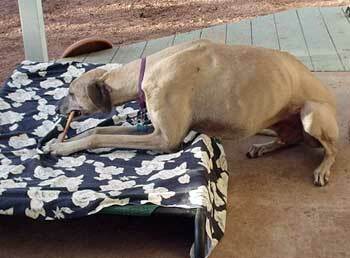 He puts the stick and his front feet on the bed, and leaves his rear on the porch! Then he gets into that Zen-like zone and just enjoys it <G> He is the best boy. Still a bit shy, but everyone loves him. When I take him with Barbie to the Greyhound Gathering in Solvang next month, he may faint from all the dogs and people, but I think it will be good for him. Everyone will be pretty dog savvy and will help me relax him. Barbie is such a social butterfly, she's really helped him come out of his shell a lot. (He's just quiet and a bit shy, nothing bad.) He'll enjoy sniffing around wine country up in the California mountains, and the whole town opens it's doors and hearts to us, so he'll get to sniff around stores, parks, you name it!